A fight for the Avdiivka industrial area continued in the ATO zone for 19 hours yesterday, on January 29. 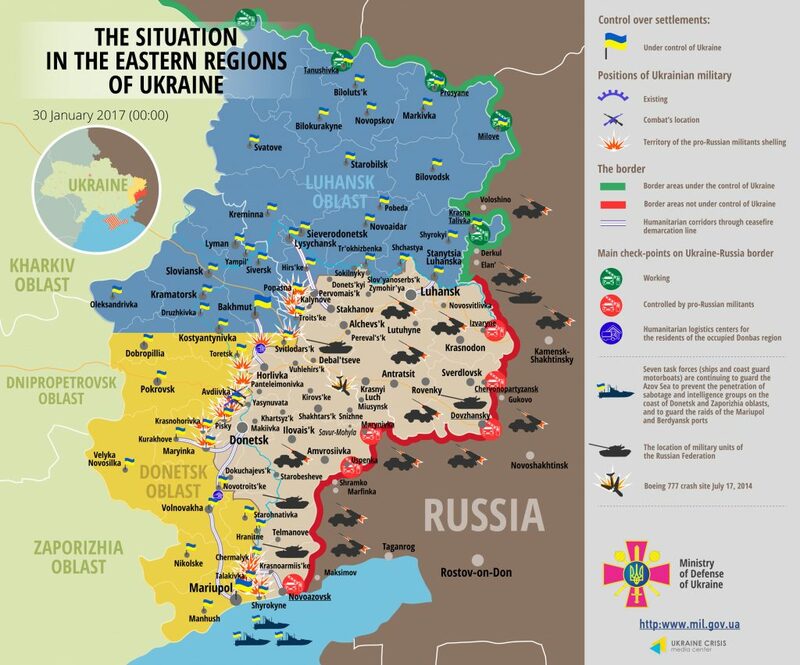 Four Ukrainian troops died, and 14 were wounded or sustained injured. According to the Ukrainian General Staff’s estimates, militants launched several hundred shells and missiles there. Hostilities continued today as well. Militants continue shelling ATO troops from mortar launchers, tanks and grenade launchers and brought rocket artillery up to the frontline. Four Ukrainian troops died, and 14 were wounded or sustained injured,” informed the spokesman of the Ministry of Defense of Ukraine on ATO related issues Colonel Oleksandr Motuzyanyk at a press briefing at Ukraine Crisis Media Center. “Militants started massively shelling Ukrainian troops’ positions around 5 a.m. yesterday using mortar launchers and cannons. Following 90-120 minutes of artillery preparation, militants changed over to the offensive. ATO troops attacked two militants’ assault teams each consisting of 25-30 troops. This hostile escapade failed as militants had to retreat,” said Col. Motuzyanyk. ATO troops seized one of the enemy’s frontline strongholds. Militants attempted another failed attack afterwards. Russian proxies were active on the flanks during the battle for the Avdiivka industrial area. “Adversaries tried and attacked ATO troops in their positions between Kamianka and Kruta Balka during morning twilight. The fight continued one hour. Russia-backed militant groups organized two mortar shooting attacks on the same strongholds in several hours, launching over 30 mortar shells. Moreover, militants attacked Butovka coal mine positions from Spartak direction a bit later, after 1 p.m.,” said the spokesman. In was a diverting attack and militants did not succeed here either. In addition to massive artillery barrage, militants shelled Avdiivka residential quarters. “Two civilians – a man and a woman – sustained fragmentation wounds. Some residential buildings were damaged too,” said Col. Motuzyanyk. Ukrainian troops took a militant captive during the fight. Apart from severe fighting in Avdiivka, the situation escalated in other areas as well. “Occupants conducted massive mortar attacks in Troitske, Zaitseve, Verkhniotoretske and Opytne. A tank advanced from hostile stronghold “Volvo-center” at Ukrainian positions in Pisky and shelled them for over 60 minutes,” said Col. Motuzyanyk. Another Ukrainian soldier was wounded in Opytne. The situation remains permanently difficult in the Mariupol sector. “Militants organized a series of mortar attacks at Krasnohorivka yesterday. Militants were shooting for several hours with recesses, launching about 120 mortar shells,” informed Col. Motuzyanyk. Militants regularly opened fire from light weapons and deployed heavy armor. The epicenter of combat moved southwards – to Pavlopil-Shyrokyne frontline area. Vodiane came under militants’ fire late at night again. They used 122-mm artillery and rocket artillery there. Militants launched 20 missiles from Grad multiple rocket launchers at Talakivka. Hostilities in the Luhansk sector took place only in Popasna area yesterday. Russian proxies used mortar launchers, firing about 30 shells. Ukrainian troops responded with fire several times. In total, eight militants’ attacks took place in the Luhansk sector yesterday, and heavy armor was used five times. According to Ukrainian military intelligence’s estimates, militants incurred severe losses in the Avdiivka industrial area yesterday. 15 militants died and 24 were wounded, and information regarding death of a militants’ battalion commander, Ivan Bakalai nicknamed “Greek” was confirmed. Report on the military developments as of January 29 is available here. Interactive data on the shelling: chronology shelling chart and the interactive map.